The National Association of REALTORS® released the October edition of the Existing Home Sales Report a few days ago, revealing a rise in year-over-year home sales across the US. September's closing were below August in a typical seasonal change, but the fact that 2011 out-performed 2010 is very good news for a weary real estate market. Not surprisingly, Tallahassee had the same market activity in this month's report. September's 170 closed existing home sales was down 13% from the 196 posted in August, but up 22% over the 139 closed resales from last year. 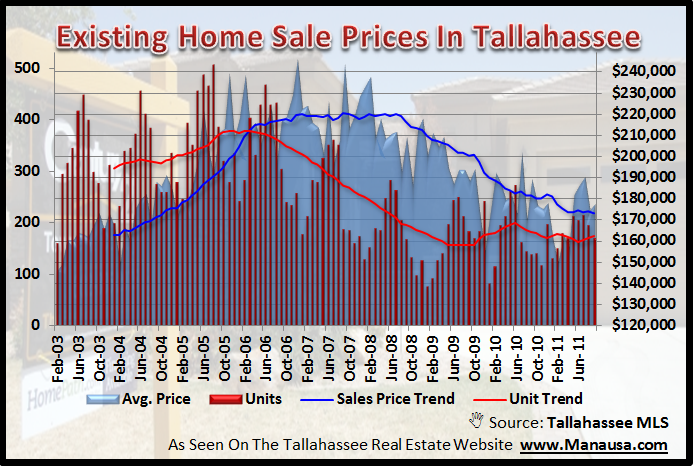 When we look at a graph of existing home sales in Tallahassee, we can see that unit sales are trending higher as average prices continue to decline. The red bars measure the number of closed existing home sales each month, while the red line shows the one-year trend (average). Similarly, the blue fill measures the average sales price each month, while the blue line shows the average sales price trend. 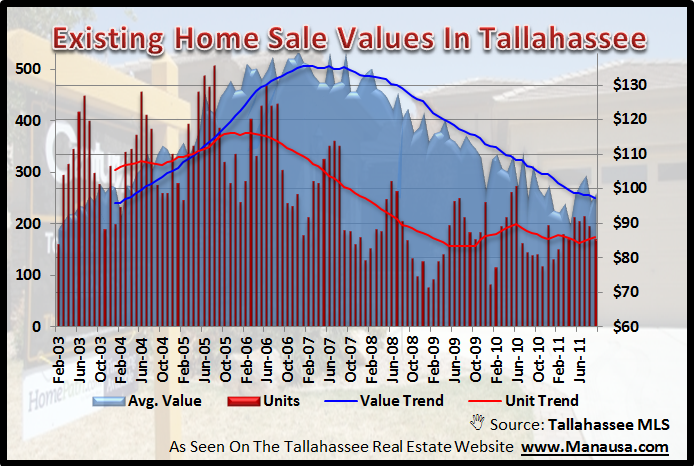 Similar to the real estate graph above, the following graph shows average home values in Tallahassee (instead of the average home prices shown above). We can see that existing home sales values are currently averaging around $98 per square foot, which is down 8% when compared to the $107 per square foot recorded in September 2010. We can expect to see continued pressure on property values as long as the current demand remains so low and inventory levels are relatively high. The existing home sales report confirms what we have been saying for quite some time. People who need to sell a home must either choose to stay out of the market for many more years, or sell the home right away with a highly aggressive real estate marketing plan. Time is not on their side with home values falling, so they should sell aggressively, or not sell at all.